How should we live as believers? Ephesians will inform us of our riches, our spiritual assets, in Christ and how we are to live. Ephesians is the most significant book for understanding our roles and responsibilities as Church Age believers. Listen to the series to put your spiritual growth into hyperdrive. 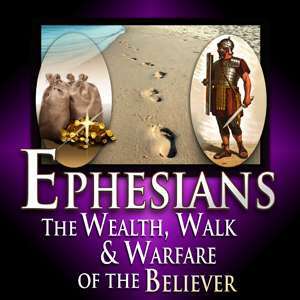 Do you know that if you’re a believer in the Lord Jesus Christ you’re wealthy? Or are you living like a street person? Listen to this lesson to hear an overview of the New Testament Book of Ephesians. Find out three distinctive sections of this book summed up by the words “wealth”, “walk”, and “warfare”. See the importance of understanding the pronouns us and we to learn that all believers are one body in Christ. To prepare for a detailed study of Ephesians, begin by reading the first chapter to understand the incredible riches you possess.